This chapter explores some of the diverse changes to production and consumption facilitated by the Internet, particularly those that embody a shift towards non-hierarchical and participatory practices. Some of these practices are explicitly informed by anarchist praxis and history. The development of independent, non-commercial communication infrastructures online has frequently been driven by a concern with evading state censorship and surveillance. These communication infrastructures are also often produced by collectives drawing on anarchist principles in their organisational forms. Other emerging practices are heavily influenced by the US libertarian subculture associated with early Internet development and with the large multinational companies that continue to shape the Internet. More interesting potential lies, perhaps, in marginalised practices being enacted outside the gaze of hacktivists, Bitcoin fanatics, and venture capitalists. Anarchist praxis is frequently at its most disruptive in the networks of solidarity and mutual aid facilitated by the Internet. By developing gift economies; disrupting the assumption that only paid labour is meaningful labour; and developing radical, anti-capitalist, and anti-hierarchical discourses around labour and consumption, they offer new possibilities growing within the cracks of the old system. 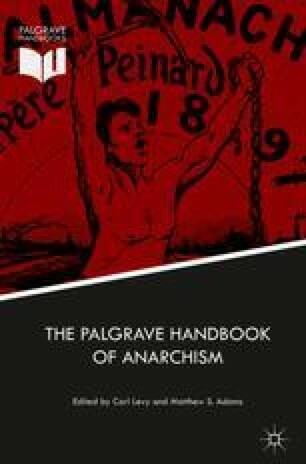 These practices are deserving of more attention than they have received from anarchist theorists to date. I am deeply grateful to Eve Croeser and Nathalie Latter for the assistance they provided in finishing this chapter.